Victoria Registry, Federal Court of Australia (VID1390/2017). Clime Capital Limited v UGL Pty Limited. 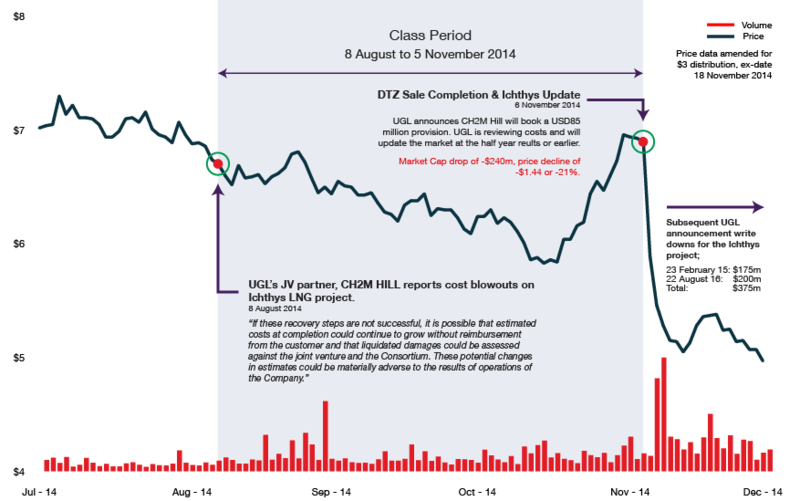 The claim alleges that between 8 August 2014 and 5 November 2014 UGL breached its obligations of continuous disclosure, in contravention of the Corporations Act 2001 (Cth), by failing to disclose that UGL’s ‘Ichthys power project’ was running behind schedule and was subject to increased project costs. All persons who acquired ordinary shares in UGL on or after 8 August 2013 and who were, at the commencement of trading on 5 November 2014, holders of any of those shares.